AGRICULTURE anywhere has two aspects—land and man, or farm and farmer. Both are equally important, though policy makers and agricultural experts often take the former—land or the farm as more important. Increasing the productivity of land and water is important, but it is only instrumental in improving the welfare of the farmer and his family, and of course the welfare of the whole population. The welfare of people at large cannot be brought about by neglecting the farmer. When we speak of the farmer, however, the hired agricultural labourer is also included for he is also a producer in his own right. But if the farmer himself is in penury, how can we expect him to pay a fair wage for labour? While India’s population increased 3.5 times from 361 million in 1951 to about 1270 million in 2014, India’s foodgrain production increased during the same period by 5 times from 51 million tonnes to 253 million tonnes, and milk production by 8.6 times from 17 million tonnes to 146 million tonnes. This made India self-reliant in food, and what is more, mainly through increase in yields and cropping intensity. Net sown area under cultivation increased between 1950-51 and 2012-13 by less than 18 per cent in the course of 62 years, and that too not because the extension of area was needed for feeding the population, but only to earn a source of livelihood by the poor. Gross Irrigated Area increased notably from 23 million hectares in 1950-51 to 93 million hectares in 2013-14, that is by 4 times. Another achievement of Indian agriculture is its tremendous diversification. From the position of being dominated by foodgrains at the time of Independence, agriculture in India has highly diversified itself—not only within crop-husbandry but also by substantially adding to animal husbandry, horticulture, and floriculture. Its status has been transformed from that being a net importer to the position of a net exporter. As a result, the annual compound rate of growth of agricultural part of GDP at constant prices kept up increasing from 2.18 per cent between 1950-51 and 1970-71, to 2.96 per cent between 1971-72 and 1990-91, and further to 3.02 per cent in the Economic Reform period from 1991-92 up to 2012-13. One more achievement of Indian agriculture may surprise a few, as it is contrary to what is normally believed. That is decreasing instability in the production, area and yield of foodgrains, not necessarily at the individual farm levels or even at the district levels, but at the aggregated national level. There certainly are failures of rainfall and of crop production at disaggregated levels, but this instability is increasingly mutually offsetting so that there is an overall declining instability. Taking three periods, 1950-51 to 1970-71 (20 years), 1971-72 to 1990-91 (20 years), and 1991-92 to 2012-13 (22 years), it is found that the co-efficient of variation adjusted for trend consistently declined from period to period in production, area as well as in the yield per hectare of foodgrains (table 2.1 in Nadkarni 2016: 76). The same thing was observed in the agricultural GDP at constant prices between the same periods (ibid, table 2.2, p. 80). This decreasing instability may have been due to an increase in irrigation and also diversification of agriculture. 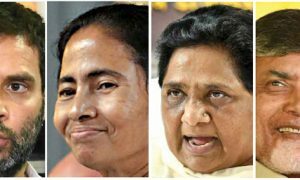 There may be considerable fluctuations at the disaggregated levels, but the country as a whole has the resilience to deal with downfall anywhere by rushing support to those who suffer. Where then is the crisis? Our agriculture may have done fairly well so far, but unless its unhealthy internal contradictions are resolved, it may collapse, with tragic human implications. Our complacency about agriculture was rudely shaken by a high incidence of suicides by farmers since the 1990s. Going by the statistics given by the National Crime Records Bureau of India, a total of nearly three lakhs of farmers committed suicide in India between 1995 and 2013. There were 10,720 farmer suicides in 1995, increasing to 18,241 in 2004, declining thereafter to 11,772 in 2013. Ballabh and Batra observe that the actual number of farmers’ suicides may well be higher still because some states did not report suicides in the initial years of this period, and some of the suicides were not included in the statistics of farmer suicides because according to police those committing them were not recorded as farmers. Only those owning land were considered as farmers, and those taking land on informal lease and cultivating, were not. Actually, these informal tenants are more vulnerable and face higher risks. Report on some suicides were deliberately suppressed or under-estimated by state governments. The crisis has not been sudden, but has been building up since decades. It needs a holistic view. First of all, we need to note that India’s agriculture is even now largely rainfed, and rainfall is tending to be more erratic and uncertain. Indian agriculture has extended to marginal lands which were and should have been better under forests. The bulk of cultivated area in India is quite vulnerable to climate change. 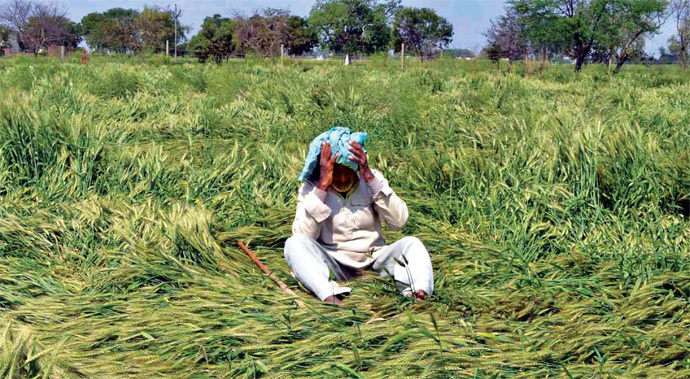 It is common now for farmers in some parts of the country to experience prolonged droughts and unseasonal rains resulting in huge crop losses. India’s situation becomes clear when contrasted with China. While China has over three times more total land than India, its arable area is only about 112 million hectares, which is less than India’s 155 million hectares as in 2012-13. In other words, while only 11. 3 per cent of total land area is under agriculture in China, nearly 53 per cent of land is under agriculture in India. But the proportion of irrigated area in China is over 65 per cent, compared to India’s less than 43 per cent. Moreover, what is considered as irrigation is itself not very stable, which is a major grievance of farmers. The rain-fed part of Indian agriculture contributes nearly half of its crop output. This is one reason why the average productivity per hectare in Indian agriculture is lower than in China. Under the circumstances, one of the biggest challenges for India since the past was to have some resilience or sustainability in agriculture at least against minor droughts. Whatever past success we had in meeting this challenge is no guarantee of continued success in future. It is particularly distressing that though the proportion of irrigated area is on the whole low in the country, several states have already reached the upper limits of sustainable irrigation, with ground water being over-exploited. It is tube well irrigation which gave a boost to the Green Revolution, but it is precisely in the major foodgrain producing states— Punjab, Haryana, Uttar Pradesh, Rajasthan, Karnataka and Tamil Nadu—that the extraction rates of ground water are unsustainably high. The incidence of failed wells is fairly high. Only in a few states— mainly the eastern states like Bihar, West Bengal, Assam, Jharkhand and Odisha—the potential of groundwater irrigation is not yet fully realised. The scope for further extending canal irrigation by building more big dams is limited because they have huge negative externalities in the form of loss of forest areas and displacement of human beings. There is, however, scope for minor projects, including watershed development, rainwater harvesting, and recharging ground water aquifers. There have been some technological breakthroughs in recent years in irrigated crops like rice (like the System of Rice Intensification), which have shown that an economical use of water can actually increase productivity—not only per unit of water, but also per unit of land. Growing more sugarcane than we actually need is one of the instances of how political pressures from vested interests have come in the way of more equitable and economical use of water. With a more economical and equitable use of water and rational choice of crops, it should be possible to reach irrigation to more lands than now, even with the given water. Birthal et al have warned that their projections indicate a loss of agricultural productivity in India due to rising temperature by 6 per cent in the short run (by 2035), 12 per cent in the medium term (by 2065), and 16 per cent in the long run (by 2100). Rising temperature needs more irrigation to alleviate its impact on agriculture. An economical use of water in irrigation to extend its benefits to more areas is thus urgent. Birthal et al further observe that it is possible to extend irrigation to further 25-30 per cent of area, by conservation in existing irrigated areas, and also by rain water harvesting. Narayanamoorthy and Deshpande have pointed out that technologies like drip irrigation which conserve water and enable extension of given irrigation water to more areas, even if capital intensive, are economically viable. This would be even more so if water is taken into account at its ecological or scarcity value, and not the face value at which the farmer gets it. 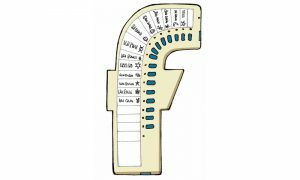 We can price inputs scientifically at their scarcity value for an industry, if the industry is commercially viable. If it is not, and if the survival of the industry is important for the economy and from a humanitarian angle, as in agriculture, there would be limits to treating it as a normal business enterprise which could be charged rationally for the inputs. How can the surplus population from agriculture be absorbed into other sectors? Only if the economic growth in other sectors is not only significant but also employment creating, not labour displacing. Unfortunately, the kind of economic growth that is taking place in non-agricultural sectors has not done the job of labour absorption well enough, because its motto is: economise on labour. The declining share of agriculture, both in GDP and total employment, has been observed in all countries thanks to faster growth of both income and employment in non-agricultural sectors. That has indeed been the pattern of economic growth almost all over the world. The relative income per agricultural worker declines only if employment absorption from agricultural sector into non-agricultural sectors is slower than the rate of growth of agriculture. How does an Indian agricultural worker’s relative income compare with the same in other countries? The ratio is generally lower than one in all countries, except in Kenya where it is above 2, but it is close to one in Malaysia in 2011, followed by Israel, USA and Australia which also have quite high ratios, indicating practically no disparity between agriculture and non-agricultural sectors in average per worker income. Taking the ratios as in 2011, India is the third lowest among the selected 30 countries. What is particularly sad about India is that its position in this respect has worsened over the four decades, which was also the case in Philippines, Indonesia, Vietnam, Bangladesh, Mexico, and Sri Lanka. 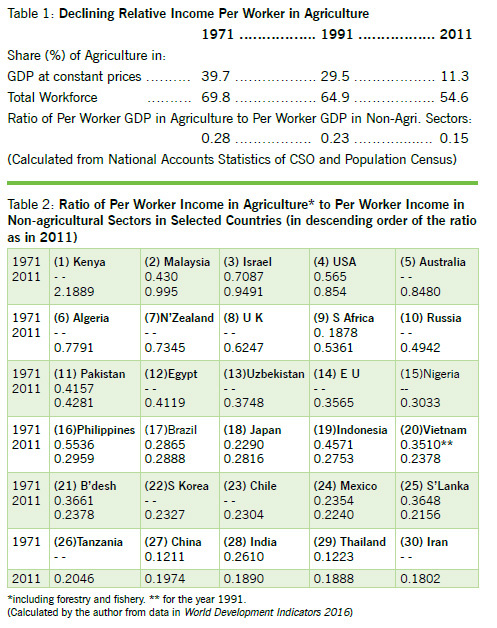 However, quite a few countries have improved the per worker relative income in agriculture—the most noticeable cases being those of Malaysia, Israel and USA, which have proved by example that per worker income in agriculture need not be destined to be much worse than that in other sectors. They could achieve this mainly drawing a significant portion of their agricultural workforce into other sectors. Thus, the share of agriculture in total workforce which was as high as 48 per cent in Malaysia in 1971 declined to 11.5 per cent in 2011. In USA, it was already low at 4 per cent in 1971, and fell further to a mere 1.6 per cent in 2011. The case of Kenya is conspicuous. It has the highest relative income per worker in agriculture, which is more than twice as high as compared to average per worker income in non-agricultural sectors. The continuously declining average size of holdings in India due to its agriculture being ‘crowded’ has been noted by many (Joshi 2015). The average size of an operational holding has declined from 2.28 hectares in 1970-71 to 1.84 in 1980-81, to 1.33 in 2000-01, and further down to just 1.15 hectares in 2010-11. This is not due to agricultural area going to non-agricultural uses, since the decline in total operated land has been relatively small, by only 2.3 per cent over the four decades. But during the same period, the number of operational holdings nearly doubled, increasing from 70 million in 1970-71 to 138.3 million. (See Table-3). Prof Dantwala had once observed that Indian agriculture might have been dominated by small farmers, but not by small farms, since the proportion of large and medium farms together—that is all those holdings above the size of two hectares which were expected to be viable—accounted for over 78 per cent of the total operated land in 1970-71. In 2010-11, this proportion declined to 55 per cent. We may feel that even now they operate a little over half of the total area, but that is not likely to be so in future, say in 2020-21. The proportion of the number of these holdings above two hectares declined from 30 per cent to just 15 per cent between 1970-71 and 2010-11. These holdings have also been facing a fast decline in their average size, though not as much as in the overall average for all holdings. The proportion of holdings which cannot earn enough income to feed the family and invest on their farms, taken to be below two hectares, increased in number from 70 per cent in 1970-71 to 85 per cent in 2010-11. The average size of these small and marginal holdings together increased somewhat from 0.48 hectare in 1970-71 to 0.60 hectare in 2010-11. But this is small consolation as it has taken place because of the subdivision of viable holdings joining the ranks of the small due to population pressure. Unless the population pressure on agriculture is reversed, Indian agriculture would be dominated not only by small farms but also by small farms accounting for more than half of the total land. Well, why not increase the productivity of small holdings to make them viable? Yes, this was exactly what was expected from the Green Revolution, but it commercialised agriculture as never before. The farmers had to buy inputs like seeds, fertilisers, and pesticides from the market. 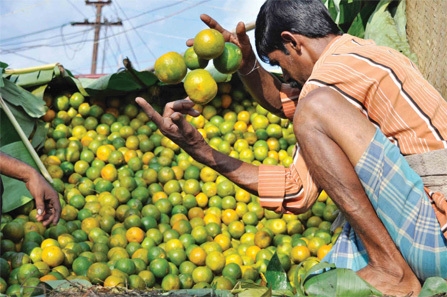 Farm operations had to be completed on time in the shortest time possible. The larger holdings could easily overcome the disadvantage of having less family labour per hectare through mechanisation of farm operations. They could more viably go for borewells or tubewells which the small farmers could not afford. Credit was also more easily available to the large farmers than to the small. Though it was claimed by the enthusiasts of the Green Revolution that it was neutral to scale because inputs like seeds and fertilisers were quite divisible according to the size of holdings, in actual practice, small farmers were put under stress. They had to buy inputs from the market, while earlier they were self-reliant using home-grown seeds and farmyard manure. The monetisation of inputs made the viability question sharper still. Another way of improving the viability of small farmers is to shift to high value crops like vegetables and flowers. Dependence on market inputs may not decline by such a shift, but dependence on the market for urgently selling increases sharply. Unless these high value crops are produced under arrangements like contract farming, their viability for farmers may not improve vastly. Unfortunately, even contract farming does not cover many farmers. The Minimum Support Price Regime is expected to protect farmers against a crash in post-harvest prices. But the bulk of farm produce is not covered by this regime. Even where crops are eligible or are covered, farmers particularly in distant corners, are either not aware of it or do not have access to it. Uncertainty in prices is still a major challenge to all farmers, particularly the small and this uncertainty specially affects producers of fruit and vegetables. Being perishable goods, the risk of adoption of such crops makes it particularly risky. 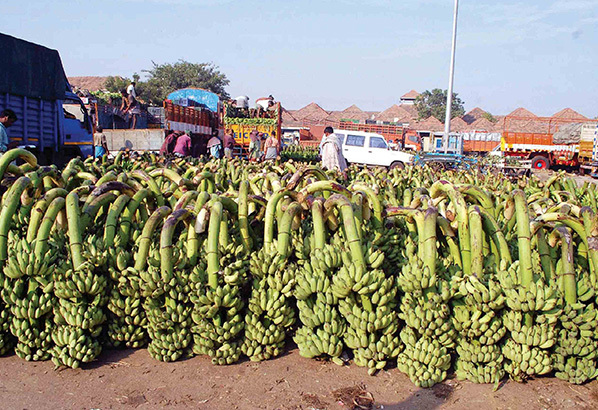 It is said that the farmer is the only producer who is penalised for producing more. 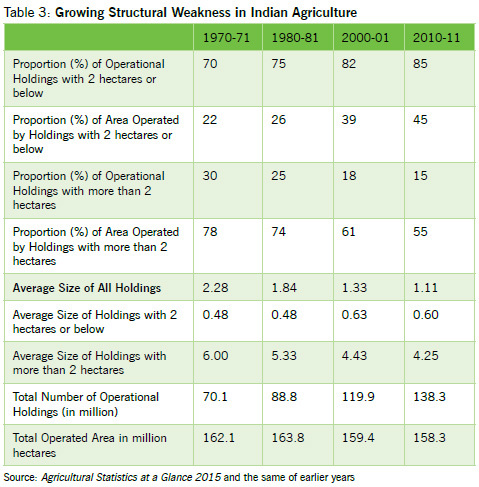 There is a general impression that profitability of Indian agriculture has declined in general. At the national level, the ratios of agricultural output to inputs at constant prices (calculated from CSO National Accounts) have been more or less constant around the mean at 2.62 as between 1980-81 and 2012-13, and showed no statistically significant trend. The highest level of the ratio was 2.84 in 1996-97 and the lowest was 2.46 in 1987-88. (Nadkarni 1996: 83). We find a mixed picture in the Table. Taking the important crop of paddy first, and ignoring Uttarakhand (which was a part of UP during the first period, and no separate data for it are available), profitability has declined in 5 states out of 8, and increased in the remaining three. Whether this difference is due to better procurement and support operations in these three states (AP, the Punjab and UP) needs further probe, which is not done here. As for wheat, another important cereal, there is an increase in profitability in all the four states for which data for both periods are available. We may recall that wheat is the best procured crop. 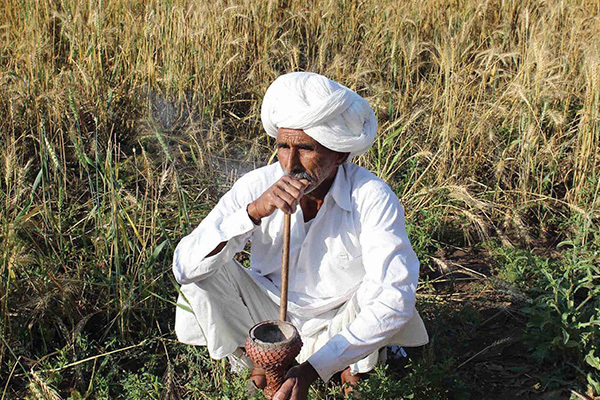 There is a decline in profitability in both the major jowar-growing states—Karnataka and Maharashtra. The profitability of growing gram has declined in both the states for which data are available for both periods. As for groundnut, while profitability has increased in AP, it has remained more or less the same in Gujarat. 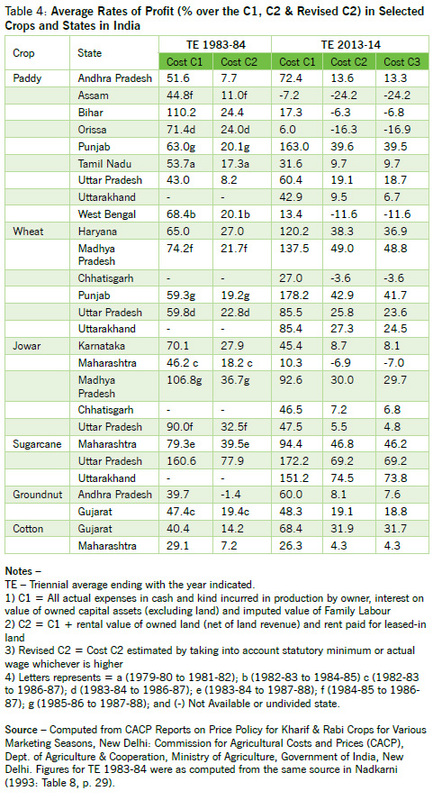 As for cotton, there is an increase in its profitability in Gujarat, but slight decline in Maharashtra. The rates of return as calculated here are over costs which include the imputed cost of family labour. The cash rates of return, therefore, should be higher and positive in most of the cases on the average. The crisis in Indian agriculture is therefore not of decline or stagnation in productivity nor of adverse terms of trade any more, though particular crops or states concerned may need remedial attention. There is no general crisis of profitability as such. A crop grown on a tiny farm, even if highly profitable in terms of rate of return over cost, may not make the farm viable in itself if the total absolute profit is not enough to take the family above the poverty level. The crisis is structural in nature, and quite basic. It is a crisis of viability itself arising from non-viable size of holdings themselves. And this crisis has been aggravating over the decades, instead of being reversed. Though the crisis of viability is not a crisis of profitability per se, it is certainly not good for private capital formation in agriculture, and its long-term profitability. What profitability we may find today is not sustainable in the long run, under agriculture which is increasingly nonviable. I had hardly expected it and found it accidentally. Kenya gained independence in 1963, and since then its population has doubled. Only 15.9 per cent of its workforce in 2011 was in agriculture, contributing 29.3 per cent of its GNP. Less than one-fifth of Kenya’s land is under cultivation. 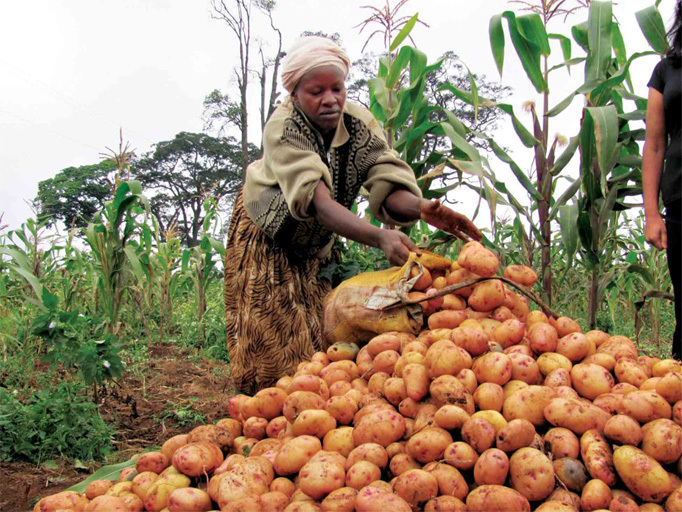 The secret of Kenya’s high relative income per worker in agriculture lies in the cultivation of high-value crops. It is a leading producer of tea and coffee, and also a leading exporter of fresh produce—cabbage, onions, mangoes, and flowers. However, the country is not yet self-sufficient in food. There are striking differences between India and Kenya. In 2011, India had a population density of 382 people per square kilometre; Kenya had only 66 people per square kilometre. Per capita total GDP of India in 2011 was 1460 US dollars, while it was only 1025 dollars in Kenya. While the headcount ratio of poverty in India around 2011 was 22 per cent, it was 42 per cent in Kenya. Yet, I guess that on the average, an agricultural worker in Kenya, by which I mean both cultivators and hired workers, must be earning more than his Indian counterpart. Most of the hired agricultural labour in Kenya are organised into a country-wide union to fight for their rights. In spite of the differences between the two countries, we have to see if we can learn from Kenya from its experience in boosting income from agriculture through high value crops, without ignoring that it is yet to achieve self-sufficiency in food and yet to remove poverty. It is likely that there is great inequality in Kenyan agriculture, more than in India, particularly between cash crop producers and subsistence producers, and between cash-crop cultivators and labourers. This would suggest that merely aiming at a high relative income per worker on the average, may not solve the problem of poverty within agriculture. A non-viable farmer is particularly vulnerable to crises. The structural weakness of Indian agriculture makes it unprepared to tackle climate change and to remain resilient. Struck by a drought, a nonviable farmer tends to sell productive assets like bullocks because he cannot get loans for meeting consumption needs in a drought, and even if a normal year returns, he would still be unable to cultivate due to the loss productive assets. Moreover, even if a farmer takes a loan for meeting investment needs, he should earn enough surplus over current costs and consumption to return the loan and pay interest by instalments at least. Non-viable farmers sometimes cannot do that, either because the holding was not viable enough to make the investment paying, or because of crop loss, or because of a post-harvest crash in the prices. When he cannot return a loan, he loses face, cannot get further loans, and thinks of an escapist solution in the form of suicide, with the hope that even if he dies, his family may get some relief or compensation from the government. Increasing dependence on the government to tide over crises, is a sure sign of increasing non-viability and vulnerability. The marginal and small farmers in traditional agriculture could survive because they had common lands where they could graze their animals and extract a good deal of their biomass needs both for the farm and the home. These common lands have greatly declined in size and number now, and have become non-existent or at least insignificant in most places, which had earlier informally subsidised these farmers and made them viable. On their own holdings also, farmers—particularly with larger holdings—used to grow trees suitable for leaf manure and fodder. Now with increased pressure on land resulting in subdivision of holdings, every inch of land tends to be used for crop cultivation with reduction in the space meant for trees. There is pressure on fallowing too. Regular rotational or seasonal fallowing was practised by farmers earlier in order to enable the soils to replenish their fertility. Now it tends to be more of a forced nature following droughts, rather than voluntary. Considerations of sustainability are sacrificed on the whole now, making agriculture more vulnerable to climate change. Thus the structural weakness of agriculture affects not only its viability, but also its sustainability. It is estimated that about 96.4 million hectares of India’s land area, which constitutes 29.3 per cent of total land mass of the country was degraded during 2011-13 period. What is further disturbing, the trend of degradation is in the direction of increase rather than decrease, for, during a previous period for which a comparable estimate is available, viz., 2003-05, the extent of degraded area was 94.5 million hectares. Thus in less than a decade, nearly 2 million hectares more of the precious land have been lost to degradation or desertification. The historic pro-farmer Right to Fair Compensation and Transparency in Land Acquisition, Rehabilitation and Resettlement Act of 2013 was tried to be diluted by the Central Government through an amendment in 2015 to more easily transfer land from agriculture to industries at the cost of farmers. When the attempt failed, the central government encouraged the states to pass their own laws of land acquisition. It is reported that some states like Tamil Nadu, Gujarat, and Telangana have already moved in the matter to pass laws or amendments which do not require the safeguards of the 2013 Act. The 2013 Act not only requires fair compensation, rehabilitation and resettlement of farmers whose lands were to be acquired, it also calls for a proper social impact assessment of the project which involves land acquisition. This has been supposed to be an obstruction in making India business or investor-friendly and in accelerating economic growth. No doubt, cultivation in India has been extended to even marginal lands, and the area under cultivation is relatively much higher than in other countries. A significant portion of land is also degraded. This would suggest that there is a case for transferring some land, particularly if degraded, for non-agricultural use. But this cannot be done arbitrarily without safeguards to farmers. The 2013 Act does not ban the transfer of land from agriculture to non-agricultural sectors, but only imposes safeguards for protecting farmer rights so that they do not become destitute. Any amendment or state law which would result in increasing the extent of destitution in agriculture, even if it is in the name of stepping up growth, is meaningless and has to be resisted. A further loss of land to agriculture without reducing dependence on employment in agriculture would only further reduce the size of holdings and the viability of agriculture. Stepping up productivity per hectare, growing high value crops, subsidising agricultural inputs, extending marketing support tailored to the needs of small farmers, and such other measures may certainly help farmers, but only in the short run as palliatives. They will not help in the long run because they are not addressed to the basic structural weakness of agriculture. In any measures to resolve the crisis in agriculture, the lot of agricultural labourers or wage workers cannot be ignored. Their proportion in total agricultural workforce has been steadily increasing in India since 1961, from 24.0 per cent in 1961 to 45.6 per cent in 2001, and further up to 54.9 per cent in 2011. For the first time, agricultural labourers have outnumbered farmers now. Due attention to the improvement in the level of their living is necessary in any policy for agriculture, but a real improvement in their conditions cannot be expected unless the viability of agriculture improves. Some agricultural workers, both cultivators and labourers, have been trying to overcome this crisis through seeking employment outside agriculture in nearby towns or cities, without giving up agriculture altogether. They commute to cities almost daily for work while still residing in villages, and cling on to their agricultural holdings as a source of security. However, this cannot be a sustainable solution to the viability crisis in agriculture. In solving this problem, the policy makers have to aim at maximising employment potential of economic growth both in the non-agricultural and agricultural sectors, rather than at maximising growth rates per se. 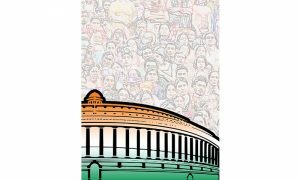 Between 2000 and 2010, India’s National Output grew at an unprecedented rate of 7.7 per cent per annum, but employment grew only by a mere 0.3 per cent per annum. Such jobless character of economic growth has only increased the employment burden on agriculture since it has to absorb residual workforce. Agro-processing units have a great growth potential which have to be encouraged in small-scale or cottage-industry sector as far as possible without compromising on quality. The consumers, whether rural or urban, need to feel confident that the products of decentralised sectors are of no inferior quality than the products of big industry, and they should get them at a competitive price. These industries need to be given marketing support in innovative ways, which can be done even by the private sector. Private industrial enterprises which can assure quality control and provide marketing support can adopt decentralised small or cottage industries, and government banks can give preferential treatment in credit support to such enterprises. Decentralised economic sectors can spread technical and artistic skills and enterprising spirit even in rural areas and can co-exist with large industries where economies of scale are conspicuous. An indiscriminate resort to labour-saving devices has to be checked somehow in large industries. Incentives may be devised for improving employment intensity of growth. It is also necessary to improve the quality of education available for rural people, which is now so poor that many students who have passed—say the 7th grade—are not able to make simple arithmetic calculations, or write a few sentences on their own, and read and understand a text book properly. Many children of poor farmers and agricultural labourers cannot hope to get more remunerative alternative employment opportunities through their presently available education. They are forced to continue to depend on agriculture. In addition to maximising employment opportunities outside agriculture so as to absorb agricultural workers, there is also a need to directly address the problem of non-viability. Of course, measures like increasing the productivity of crops, growing high value crops, and diversification of agriculture such as to increase employment in animal husbandry and poultry, should continue. But besides these, there has to be an effective and widespread movement for consolidation of non-viable holdings into viable ones. Farmers participating in this movement should be given special incentives. Farmers selling non-viable holdings should be assured of not only a fair price for their land, but also alternative employment opportunities. Banks should extend credit to small farmers buying land to make their holdings viable holdings. There should, however, be no force or unreasonable pressure to sell non-viable holdings. If the farmers are not willing to sell their non-viable holdings outright, they should be free to lease out tiny holdings to a farmer who can consolidate them into a viable one and pay a fair rent. The lease market may have to be liberalised and formally recognised so as to give access for tenants also to bank-credit for investment. 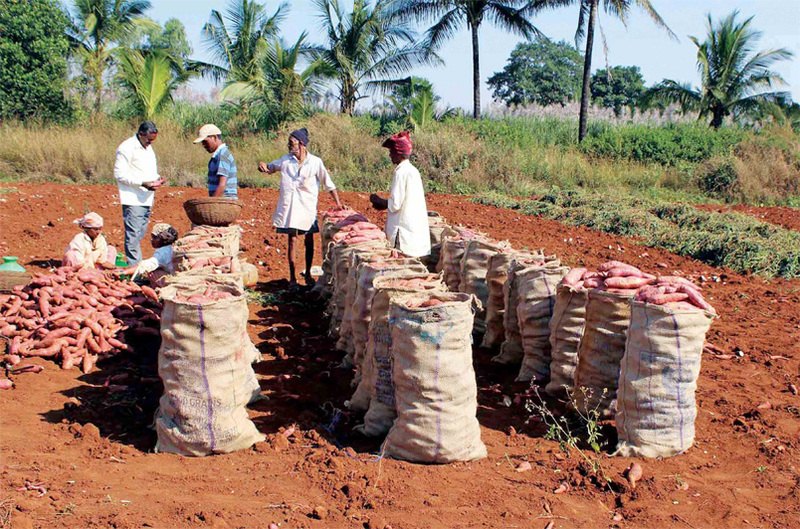 Co-operative farming under which not only a large number of non-viable holdings could be consolidated, but even agro-processing industries can be started, may also be encouraged by the government, who can give special incentives for such co-operative farming enterprises. Highly individualistic attitudes come in the way of coming together in a joint co-operative spirit. Once, however, economic benefits of mutual trust and sociability are realised, a mighty force of economic enterprise and growth can be released for the welfare of all involved. 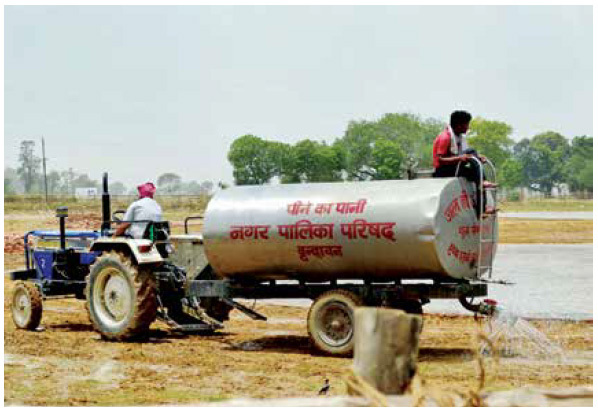 Indian rural society has shown some evidence of institutional innovation, as for example in the emergence of dairy and sugar co-operatives, and water markets.